A Lender's policy protects the mortgage holder. If there is a fault in title that results in a loss, the mortgage holder will be paid back. What is a homeowner's policy? A homeowner's policy protects you, the purchaser, against a loss that may occur from fault in your ownership or interest you have in the property. You should protect the equity in your new home with a title policy. What does a homeowner's policy provide? What "hidden risks" are protected under a title policy? Once purchased, title insurance remains in effect for as long as you own your property. Title insurance adds security and peace of mind to homeownership. Let the title company, attorney or agent handling the closing of your property know that you want to purchase an Owner's Title Insurance Policy. When choosing a title insurer, look for a company with experience, as well as the financial strength to protect you. 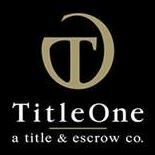 TitleOne, a team of the industry’s top professionals, providing innovative technology, streamlined closings, and legendary service to ensure your title and escrow transactions are a success.